This large modern clock is a great addition to any home or office. Shannybeebo Clocks creates functional art that will enhance your existing decor, and make a great gift for any occasion. The reclaimed birch wood clock is stained & painted in perfect detail. 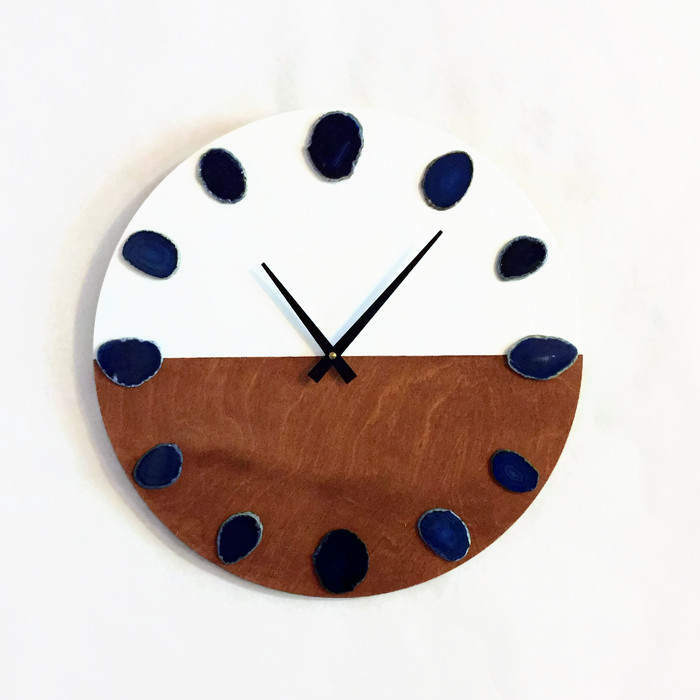 Blue agate slices serve as the number markers, making this analog clock easy to read from a distance. Clock size 14” x 3/8”. This clock can be personalized to fit your design needs. The clock shown sold, but other can be made using similar products. Each will be unique due to the nature of the natural agate slices. This clock was lower quality than I expected, both the wood and clock mechanism felt cheap. Same with the paint and the geodes. Now considering the price, it doesn't really feel worth what I paid for it. Also, budget about a month for shipping. Beautiful clock. Will definitely be back if I need another clock for any room. Really ties the room together. LOVE this clock! Perfect addition to our nautical themed room. I LOVE my custom clock!!!! I've been searching for a clock with a very specific shade of blue & stained wood color so it ties in perfectly with my wine room. Shannon sent over SEVERAL examples, she wanted to make sure it was just right for me. After mixing the custom paint, figuring out which stain to use, we finally found the perfect match! She was patient, responsive and on point! She also suggested ways I could determine what size and shape clock I wanted. The clock is STUNNING! Her customer service was stellar. If I could give her 300 STARS I WOULD! :) I highly recommend her work and professionalism. I know she does everything to ensure her clocks are of the highest quality, and exactly what you want. I know because we worked on mine for weeks. haha I will be back for more, THANKS AGAIN SHANNON!